The before-school scene is pretty typical at Montclair’s Edgemont Elementary School, with parents shouting to their children to have a good day and those children, in turn, chattering excitedly with classmates about the latest school yard news. However, unlike most schools, Edgemont is beginning to see its front entrance becoming slightly less crowded with cars and more crowded with families strolling over from the park across the street. Providing a background to these morning exchanges is the sound of the humble catalyst for an increased sense of community: the faint, periodic chiming of the school’s Zap Machine, a key part of the Boltage program. The idea for the popular “Boltage @Edgemont” program began in November 2009 when a parent contacted Jennifer Hanawald, Edgemont Elementary School’s Health and Wellness coordinator. The parent suggested Hanawald try bringing the Boltage bike/walk encouragement program to the school. Considering the school’s impressive track record regarding walk and bike events, including International Walk to School Day, Hanawald decided to further investigate the program. When looking further into the program, the positive behavioral changes seen in other communities that tried Boltage seemed encouraging. The program also had the potential to work well with the school’s Montessori philosophy of fostering interdependence among community members and creating healthy habits for the mind and body. The only issue holding Edgemont back was funding. In a flurry of paperwork and networking, Hanawald and her fellow volunteer, Blythe Eaman, managed to secure a NJ Healthy Community Grant and began to implement the Boltage project the very next year. 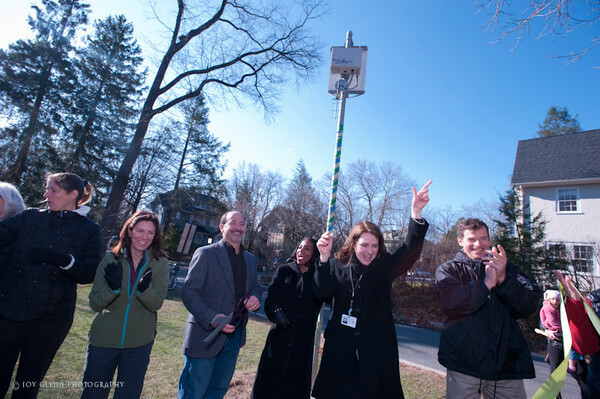 The centerpiece of Boltage is its solar-powered “Zap machine.” The “Zap,” for short, consists of a tall, metal pole topped with solar panels, a wifi-enabled control box and a radio frequency identification (RFID) antenna. Students are issued a RFID-coded tag that attaches to their backpacks. As they walk or cycle by, the reader picks up the coded ziptag and acknowledges the student’s travel with a musical “beep,” just like a scanner at a grocery store. Though students are encouraged to participate, they are in no way required. In terms of safety, Hanawald explains that they have four crossing guards available. “That’s helpful, but we are a busy urban/suburban town. People have to make their own decisions about how to participate.” Furthermore, since Edgemont is a magnet school, many families come from farther away but are encouraged to still participate by driving to a park near school and walking or cycling the rest of the way. Edgemont students are able to track their individual progress as well. They simply go online and log-in to their account. As part of the initial registration process, parents create a profile with the distance their child walks or bikes to and from school. The data is collected on a secure server that includes no personal information—simply a user name and the child’s typical walking or cycling distance. Using this information, coupled with the uploaded data from the Zap, students are able to track their number of trips, miles traveled, number of calories burned and pounds of CO2 saved by replacing a car or bus trip with self-propelled transit. Edgemont further publishes overall school progress in the PTA newsletter to parents and recognizes exceptional student achievement. As a national program, Boltage also keeps track of schools across the United States. So far, schools have registered over 435,000 trips, traveled 650,000 miles and burned 29 million calories. They have avoided the use of over 58,000 gallons of gas and saved the planet from 1.1 million pounds of CO2 emissions. The students also receive special incentives that encourage them to walk more. In keeping with its focus on keeping a healthy mind and healthy body, Edgemont issues simple prizes like acknowledgement, wristbands, stamps or fruit. Edgemont’s Boltage program has been largely funded by a Healthy Community Grant from the New Jersey Department of Health and Senior Services (NJDHSS). In conjunction with Family Health Services – Office of Nutrition & Fitness (ONF) and the New Jersey Council of Physical Fitness and Sports (NJCPFS), NJDHSS provides grants to organizations looking to fund programs that stymie the increase in obesity and serious chronic disease. The grant operates under the principle that altering the physical environment will encourage people to make healthier decisions and lead a more active lifestyle. Moreover, the grants are issued as “seed” money. The grants range from $2,500, to $10,000. The smaller grants are to act as a catalyst with the hope that they will give organizations leverage to attract grants from other community resources. The continued support, on the other hand, was a bit more work as it required building a wide network of supporters. “We had full backing of our principal and several township leaders and bike stores, as well as the Montclair Health and Wellness Partnership,” explains Hanawald. The program’s co-chairs, Hanawald and Eaman, spent many hours getting the project started. 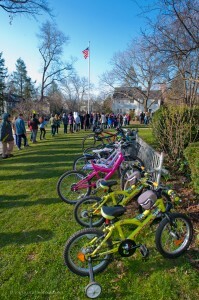 They networked with local businesses and the Bike & Walk Montclair advocacy group beforehand, and along with the principal, garnished support from the school’s staff, faculty and PTA. The kickoff event took place on April 6, 2011 and was preceded by a number of surveys, flyers and phone calls. On the day of the event, the entire student body attended the kickoff and over 125 students excitedly listened to the musical chimes of the “Zap” machine as it acknowledged their trip distances. “The kids sort of knew the program,” explains Eaman, “but we wanted to explain Boltage and its technology to the parents and the community, and to celebrate Edgemont’s commitment to walking and biking. It was also a thank you. We invited the Montclair Public School’s Health and Wellness Partnership, the YMCA, the mayor, Bike & Walk Montclair, and everyone else who helped us secure the funds.” Other guests included Elise Bremer-Nei, the NJ SRTS program coordinator at the New Jersey DOT and various leaders in the community. Students have lots of positive feedback. “I like Boltage because it gets you strong, healthy and it exercises you. And you get calm for the beginning of the school day,” writes one first grader. The program has also resulted in a stronger family and school network. “It’s been community-building for our school,” says Eaman. “Families are walking together and meeting up with other families on the way. Parents are walking home together. People are connecting.” To learn more about how to bring Boltage to your community, visit: www.boltage.org. This entry was posted in Bicycling, Encouragement. Bookmark the permalink.